Our formal living room has been the place where boxes are unpacked, things are sorted, messes are made… every house has one, especially after a move. Most of the time, I bet it’s not the first thing guests see as they walk through the front door. Time for a change! The goal for the room is to keep it as an open space where the kids can run & play, but where adults also have a space — a functional nice-looking space. I wanted something soft, unique… a statement piece. It had me at antique wood carvings. It was dirty, had that “old couch” smell, and clearly needed some TLC. I thought about how nice it would be to buy something perfect, plop it right into its spot and be done with it. But, that’s not really my style, is it? Anything “done” that fits my picky taste (like a gorgeous wood & velvet sofa I had seen online that week) will be well out of my non-existent budget. Anything without a ridiculous story would be boring. Anything vanilla would be vanilla and thus completely out-of-place in my eclectic world. So, it found it’s way into our formal lounge-play room and before the day was over I had returned from returning the truck. Of course, the girls were interested and took to wanting to play on it. I couldn’t touch it without wanting to wash my hands so I had to do something. I grabbed Chloe and off we went to buy some fabric. I had picked up a swatch during my errands in the morning (before checking out the sofa) and sure enough, it went perfectly with our stuff. Back at home, I started disassembly. Clearly I was determined to get this done. I can’t stand unfinished projects and I also can’t stand dirty, smelly, 90-year old sofas rotting in the corner. Note, I’ve never upholstered a sofa before. I’ve stapled new fabric onto dining room chairs and I did once reupholster a 1966 Mustang in my parent’s guest room when I was 15, but my only qualifications for the job were a) wanting to get this done and b) being pretty good at figuring things out by dismantling them. So, without further adieu… I took a screwdriver and began separating the stapled-on fabric from the sofa. I found that wrapping duct-tape around the screwdriver helped to protect the wood. This piece had been reupholstered previously in the 70’s with this lovely floral number. Underneath, I found a very faded beautiful blue… pretty much identical to the blue I had picked out. I was having a serious case of “is this piece worth investing in?” moment, and it helped knowing that I was bringing the piece back to an updated version of it’s former glory. The original was nailed on. The trim had been completely removed, but I’d guess it matched the blue, beige, and red. Taking careful note of how each piece was put on, I peeled back the layers like a stinky, dusty, 90-year old onion. I found all sorts of treasures: a fake fingernail, twenty-six cents, what I assume were very old rubber bands, lots of broken pencil tips, BBs & pellets, and what I believe was a large quantity of rabbit turds. Oh, and what I assume was a bullet hole. I hate it when I’m sitting around in my fancy chair and I get so excited that my 6-shooter goes off right in the holster!- There were no blood stains, or that would have been the end of this adventure. I would have loved to stop there, but with Jason’s eyes about to roll out of his head and two little girls who I knew wouldn’t be able to stay away too long, I powered through and vacuumed the hell out of that sofa — literally. Then I sprayed it down with hydrogen peroxide. As crazy as that sounds, especially with it sitting on my antique Heriz, I do a ton of household cleaning with peroxide because it chemically breaks down human grossnesses (urine, skin, blood). So by “sprayed down”, I mean DOUSED. I didn’t see anything, but 90-years of sitting strangers needed to be removed. The original fabric was left on the inside surfaces and the back had batting added on top during its previous make-over. The original fabric on the outer parts, the sides and the back, were previously removed. With my trusty shower-curtain-turned-drop-cloth, I set up to restore the wood finish. I considered painting it (white, of course), but in the end, remembered how nice our white sofa looked with our dark wood media console in the family room. White & stained wood has been one of my favorite combinations the last few years. The owner of a popular furniture re-seller in Austin let me in on one of her best secrets: Restor-a-Finish. Along with 0000 Steel Wool and some rubber gloves, you can breathe some life back into old stained pieces in literally seconds. I’ve used this stuff on wood floors, crappy imported furniture, antique furniture, doors… everything. Here’s a side-by-side of before (on the left) and after (on the right). You just rub the product on with the steel wool, wipe dry, and viola! Seriously, this stuff is awesome. After going over the entire sofa, it’s hard to tell from this photo, but it made a huge difference. Finally, time to start putting this thing back together. The last part to come off was the base of the sofa (under the cushions). It was underneath everything, so clearly this was the first piece to go on. I started there by measuring the width and adding on 10 inches (5 for each side) for the fabric go go through the sides and attach (there are photos!). Then I measured the depth of the cut, allowing for it to be folded over in front to hide the staples and feed through the back to be attached on the back side. Then, I folded the fabric in half the long way to find the middle. With the right-side of the fabric towards the center wooden foot, I began stapling the new fabric onto the chair from the center to the sides. I used a no-frills staple gun that I bought years ago. The plan: to create a clean line with no need for trim. Piping would have allowed for a higher margin of error. If you plan to use trim around all of the fabric, there’s no need to fuss over hiding the staples. Originally, this sofa would have had trim covering the nails. The keyword to this project is “finesse“. You need a whole lot of it if you take on a job like this. The first part that needed significant finesse was tucking the corners around the base of the sofa without getting a wrinkle. The 70’s upholstery had a stitch here, but I finessed myself right out of needing that seam. The sides of the base of the fabric were originally pulled through to the outside of the sides, so I did the same (this is where photos make a lot more sense than words). After doing this on both sides, I pulled it through to the back and stapled the heck out of it. Then, I stapled the sides and trimmed off the excess fabric. Then I sat back and admired how beautifully I had accidentally matched the original color. I mean, seriously! Then, I cut fabric for the back the same way… a little excess at the top and enough on the sides and bottom to allow for tucking and stapling. I found the center of the fabric by folding it in half and put the center onto the center of the top of the sofa. The rounded lines made this part very difficult It would have been much easier to do exposed staples covered in trim, but it didn’t go with the updated look I was going for. I had to keep folding the fabric back over to get the fabric to follow the curved lines. After finishing the top of the back upholstery, I folded and tucked in the sides and the bottom, tucking the bottom through to be stapled on top of the back of the bottom piece. There wasn’t a way to conceal staples all the way down the sides of the back piece, so I ended up gluing that part down. Starting with the top front corners, I started stapling away. I started at the corners because they need to be very crisp and since I had to conceal staples on the top and one side of this piece, I wouldn’t have much access to it further along. After initially stapling the corners tight, one side needed to be folded over so that the pretty side of the material would lay flat once flipped over. It took more finesse to staple the far sides. When I got to the inner part of the armrests, I folded the fabric so it would have a clean line, then pulled and tucked it through the bottom to the outside. And trimmed. And was tired and went to bed. Ready to tackle the outer upholstery. Starting with the side panels, I first stapled the top. These staples didn’t need to be concealed because I planned for trim, but I did it anyway on just the top part since it was easy to do. Then I folded the fabric to make a clean line and stapled the sides of these panels. Then, folded the bottom to the right length and stapled. Finesse was required to get this the right shape. I had cut these a few inches taller and wider than the panel area measured to give plenty of room to play with. Next up, the back panel. I folded this piece in the middle to find the center. I didn’t bother concealing staples this time since the curved line was a challenge. Starting at the middle, I folded the bottom of the back panel fabric to make a clean line, pulled it around to the bottom, and stapled. Then I stapled the sides. The lines didn’t need to be completely clean since the trim conceals them. After playing with the girls for a bit, I tackled the trim (with Chloe’s “help”). And laid on a bead of glue. There’s that trusty blue tape again! Blue tape is to crafting women as duct tape is to handy men. I started on a side panel at the bottom/rear corner. Taped it in place, then continued the bead of glue until I got to the corner. At the corner, I glued and taped, then put a bead of glue from about mid-way across the trim to an inch-or-so up the panel. At the last corner, I cut the trim at a 45-degree angle so it would blend with the folded corners. I did both side panels & left them taped to dry overnight. I did the same thing in the back, only I terminated the trim underneath the sofa (out of sight). This was a great stopping point! I bought foam at Joann’s Fabrics. You can also order nice replacement cushions online, but that doesn’t work well when you’re determined to get a project finished ASAP. Foam can be super expensive. I caught them during a 50% off foam sale and stacked iPhone app coupons from Joann’s, Michaels, & Hobby Lobby. The foam comes in 24″ widths and the cranky cutter let me get away with asking for “three 21-inch pieces”, but wouldn’t cut it the other way for me. I had a cool cutter during my Pottery Barn Anywhere Chair DIY Project purchase that made a million cuts for me even though there was a line. I also picked up 3 zippers in the longest size they carried in a color that was close (grey) and was not dual-seperating jacket-style. I cut the material and sewed cushion covers. This sounds really hard, but I’ve never had a formal sewing lesson, didn’t use a single pin, and had no pattern. It’s intimidating if you’ve never done it before, but sewing is really pretty common sense. After a bit of practice, you’ll figure out how to get along with the machine and solve common problems. For instance, after years of sewing, I couldn’t figure out why one side of the thread was pulled tight and the other was loose. A friend, who has had formal sewing classes, let me in on a little secret: change your needles often and try different kinds (you know who you are, THANKS a MILLION). My first machine was very particular about the direction the thread was pulled when getting started, a hint my mother gave me. This is relatively easy because it is all straight lines! Also, get a zipper foot if your machine didn’t come with one. Trying to sew a zipper without one is like trying to cut steak with a baby spoon. The hardest part is getting everything to line up right. I probably spent more time making my fabric cuts so they would actually be square. Don’t be intimidated by sewing! Here’s the finished “formal lounge/play room” sofa all made over! This old gal is looking pretty good for 90 years old. I do plan to fluff the cushions a bit by wrapping them in batting, but it’s ready to enjoy! Sofa + materials, I’m all in for under $300. Not bad for a few days work while at home with the kids! 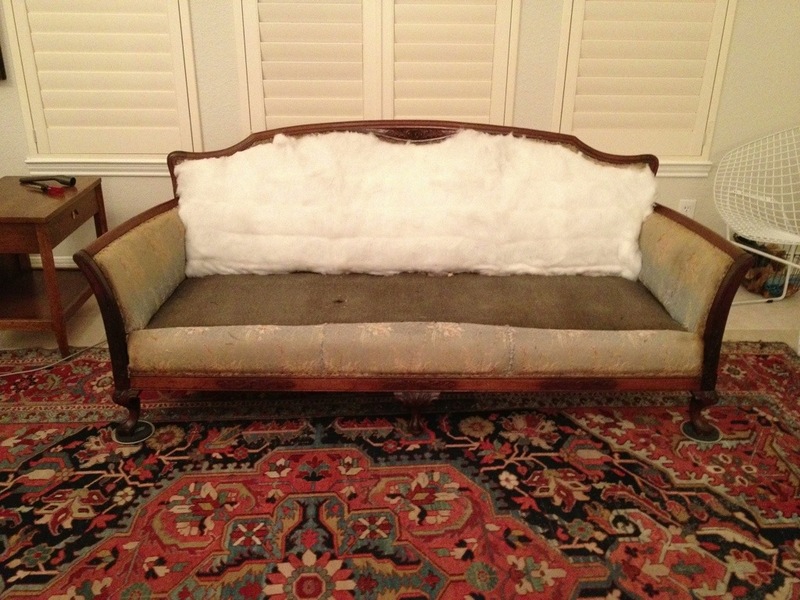 This tutorial is amazing and makes me think I can do something with my antique sofa my neighbor gave me. The fabric is worn and was left in the rain so it’s stained. I was thinking of painting the fabric, since that’s the trend these days because I didn’t think I could afford to reupholster. Your tutorial gives me hope! I’d love to see it when you’re finished! I painted a curtain and it ended up pretty stiff. I would only paint if you’re going much darker and won’t need to use as much paint. Reupholstering is a lot of work, but if you plan for it it can be very rewarding. Let me know how it goes! I live in Philadelphia and am about to tackle almost the same exact project! would you be able to be in touch with pointers? Please let me know! thanks! Wow, such an amazing work!! Looks so nice! Hi I really love the design of the sofa and the colour of the velvet that you refinished it with. 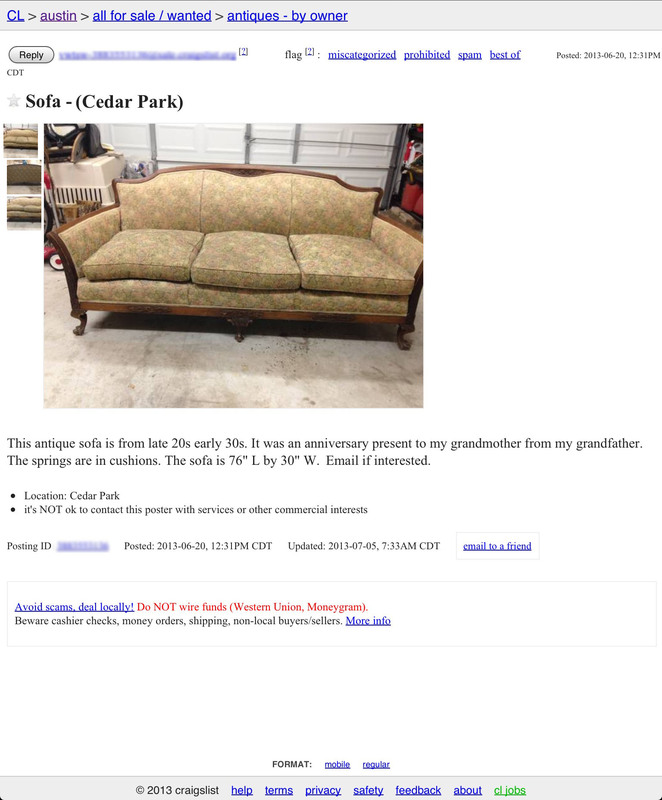 I have a quick question, roughly how much fabric did you use to recover the sofa? So sorry, I’m really not sure. I had 9 yards and had a lot left over. It depends a lot on the width of your fabric. I was able to get 2 cuts out of 1 width. I used about 5 yards. How many yards of fabric did you end up using when all was said and done? How many yards of fabric did it take to cover the sofa? Also wondering the same! Looks great!! I’m getting geared up to reupholster a sofa very similar to this and this article is so helpful. Thanks for the wonderful tutorial. Yours turned out beautiful! FYI. Much easier to use a hot glue gun to glue down the gimp (technical word for this kind of trim). You don’t have to tape and it dries in seconds. It is actually what upholsters use.